New 2012 Renault Clio review | What Car? The 2012 Renault Clio is an all-new supermini built specifically to take sales from rivals in this extremely competitive sector. That will be no easy task, with cars such as the Ford Fiesta, Volkswagen Polo and newly-launched Peugeot 208 to compete with. It's impossible to overestimate the importance of a new Clio to Renault, because the current car is one of the few Renault models still held in high regard by UK buyers. 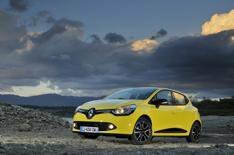 If this new Clio fails, it could sound the death knell for the company on these shores. Fortunately, the new car's showroom appeal exceeds that of the previous Clio, due to its sharp exterior styling and an interior that's vastly improved, both in terms of quality and design sophistication. What's the 2012 Renault Clio like to drive? Eventually, there will be a wide range of petrol and diesel engines to choose from, including an optimised version of the 1.5-litre diesel that will average 88.3mpg and emits just 83g/km of CO2, a 1.2-litre mated to a six-speed dual-clutch gearbox, and a 200bhp 1.6-litre turbo for the hot Renaultsport version. For now, though, we've driven only the 89bhp 1.5-litre diesel and the new 89bhp 0.9-litre three-cylinder turbo petrol. The three-cylinder engine sounds a little clattery at tickover, but very little mechanical vibration seeps through to the cabin. Once settled at a steady pace you'll struggle to tell it apart from a more cultured four-cylinder engine. Performance is more purposeful than forceful; the engine picks up revs smartly and there's a decent amount of punch when the turbo comes into play at around 2500rpm. Throw in a few inclines, though, and you'll need to be smart with your downshifts and keep the accelerator pressed to the floor to maintain progress. The additional cost of the 1.5-litre diesel engine means it's likely to have less appeal. That's a shame because its 162lb ft of torque, willingness to rev and smooth mechanical refinement really suit this latest Clio. The chassis is a development of the outgoing model's, albeit with a wider track to improve grip and quicker steering to sharpen turn-in to corners. However, the most noticeable improvement is the consistency in the weighting of the steering. While the previous Clio's felt excessively light at low speed and vague on faster roads, the new model's set-up has a meatier feel at all speeds. The Clio might not have the supreme handling precision of a Ford Fiesta, but that's not to say it's short on engagement. If anything, it feels rather soft and a little nose-heavy when you push it to extremes, but it's still pretty game and can be made to flow through a series of bends with enough vitality to put a smile on your face. In normal motoring conditions the Clio soaks up bumps effectively, but perhaps its most appealing trait is the way it feels so secure on the motorway. What's the 2012 Renault Clio like inside? This is where Renault has spent the vast majority of the Clio's development budget. Where the previous car's interior was about as welcoming as a damp coalbunker, the new cabin oozes intrigue and sophistication, due to a dazzling array of eye-catching embellishments. Chief among these are the colour-coded steering wheel inserts, flashy chrome-ringed instruments and a central touch-screen that shamelessly pays homage to the latest generation of portable infotainment tablets. We're not normally fans of touch-screens in cars they tend to be fiddly to use on the move but the Clio's screen has large, spot-at-a-glance icons, so it's impressively simple to navigate. Just as well really, because not only can you control the stereo, phone and navigation systems through the screen, but also download apps. Although it's only a centimetre here and there, the latest Clio has grown in every direction, so there's more head- leg- and elbow room, along with a decent range of adjustment for the driver's seat. All models come with a height- and reach-adjustable steering wheel; in the previous Clio this was reserved for pricier trims. The boot is on the large side at 300 litres, while a 60/40 split rear seat helps boost practicality, although a step in the floor means it is not entirely flat. This latest Clio will be offered as a five-door only and in case you were wondering, the rear door handles are located high up in the rear window frames. Without doubt this is the classiest Clio ever. The quality is a phenomenal step up for a small Renault, while the sophisticated interior design leaves a Volkswagen Polo looking like a 1930s gramophone alongside an iPod. Throw in a neat and tidy drive and affordable ownership costs, and the Clio looks pretty irresistible.